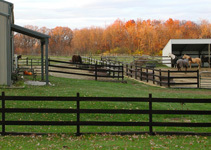 There is always something to repair, replace or improve on a horse farm. It has been awhile since I updated this page. We have installed automatic waterers in both paddocks now and we built a new entrance gate. I will add those pictures soon. After 16 years the drywell for the east barn plugged up, so that had to be dug up and replaced. We did more work to improve the drainage away from the storage building and finally got a new overhead door on the machine shed! The all-weather paddocks are working out well but they need a little gravel added each year. Our neighbors to the east asked us to use 3 acres of their land for pasture so that they wouldn't have to mow it. We were happy to help them out! And the horses are happy to "mow" it for them. You can see a video of the horses enjoying their new pasture here. 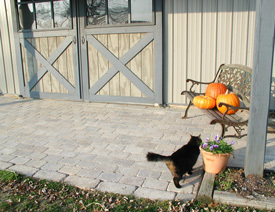 We also added some pavers outside of the entry to the new barn. To see more photos of the farm, click on the Around The Farm link on the Photos page. All of "the kids" are fine. No additions. No subtractions. Some of them are getting pretty old though. email: info AT newmoonfarm DOT net| ©2009-2012 New Moon Farm, Inc.